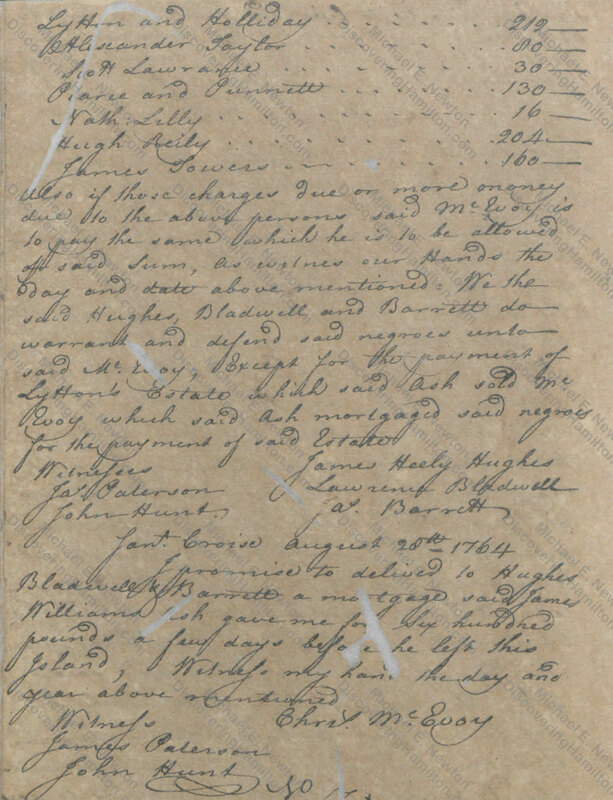 In 1752, James Lytton purchased from Emanuel Aboab a half plantation at No. 45 Queen’s Quarter, which produced cotton, and a small area designated No. 46 Queen’s Quarter, which was devoted to provisions or pasturage and was just one-sixth the size of a full plantation. 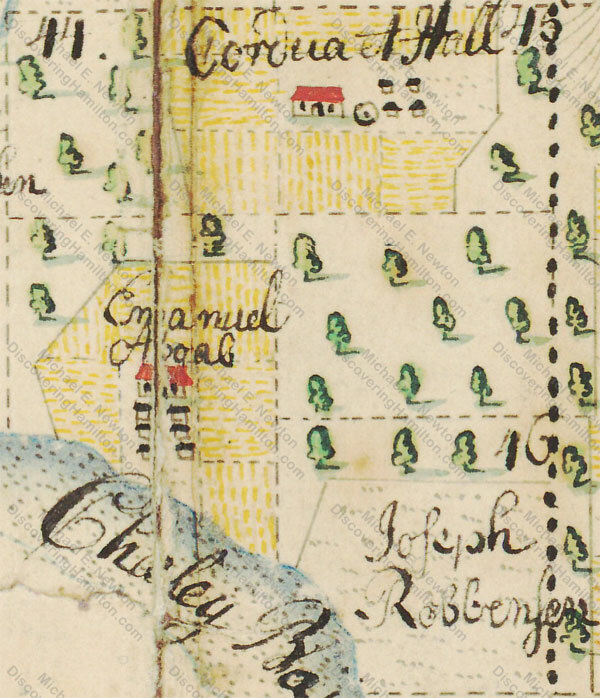 These properties purchased by James Lytton were adjacent to James Ash’s half plantation at No. 46 Queen’s Quarter. To purchase this land, James Lytton assumed from Aboab 11,000 rigsdalers of debt owed to the Danish West India Company. 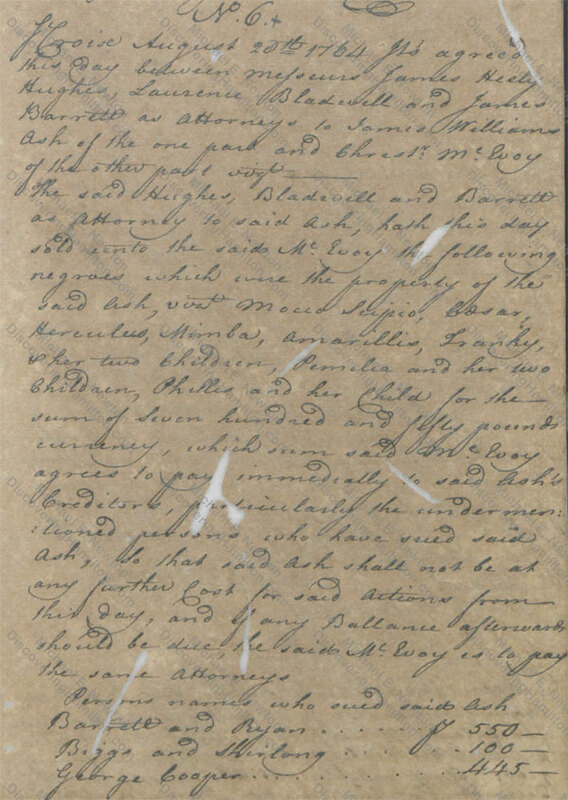 As will be noticed in the matrikel above (and subsequent matrikels), James Lytton did not live on this new plantation nor did he devote any slaves to its development (though it is possible he diverted slaves from his main plantation as needed or hired slaves to work these lands). It would thus appear that the purchase of these lands was primarily for speculative purposes, though one assumes that Lytton did not let the cotton plantation lay fallow. In April 1756, James Lytton sold these two properties to James Ash. 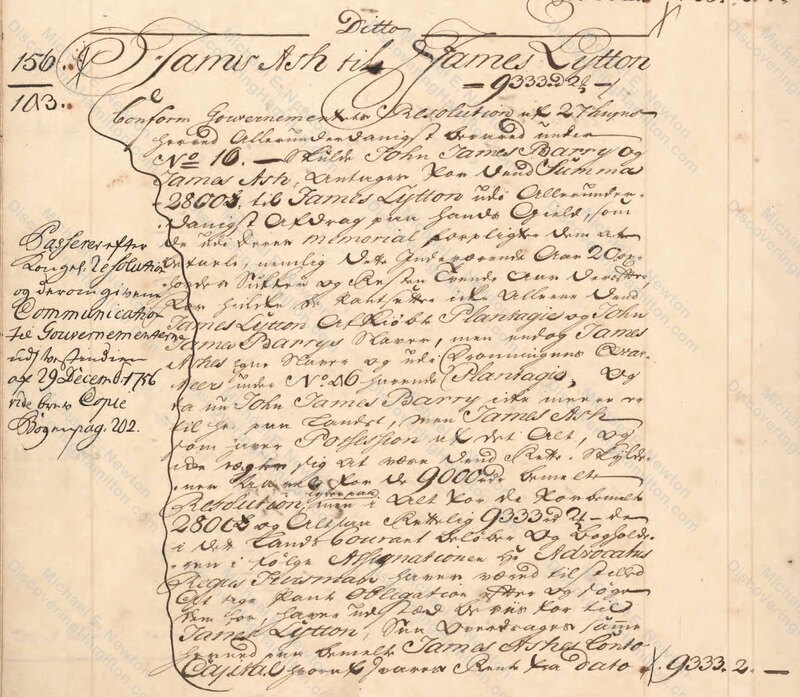 As part of this transaction, James Ash took on 9,333 rigsdalers of debt owed by James Lytton to the Danish government, which had taken over the accounts of the Danish West India Company. Having assumed 11,000 rigsdalers of debt to purchase these properties, it would appear that James Lytton lost 1,667 rigsdalers on this speculative venture, but this probably was not the case. 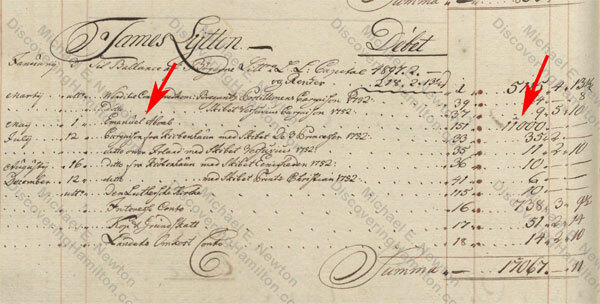 It appears from the records that James Lytton’s original purchase included some slaves which he had transferred to his main plantation and did not sell to Ash. It is also possible that James Ash gave Lytton other funds in addition to taking on the debt. It was quite common on 18th century St. Croix for relatives and friends to do business together. In fact, it was the norm. James Lytton and James Ash were not just two strangers doing business together. James Lytton had been the guardian, virtually a father, to James Ash’s wife Margaret Evans. 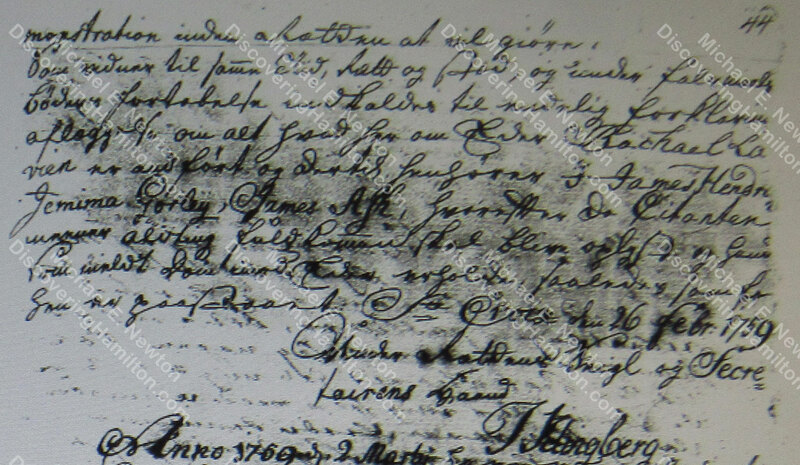 It could not have been a coincidence that James Lytton purchased land adjacent to James Ash’s estate. Lytton may have relied on Ash to keep an eye on his property and perhaps hired Ash and some of his slaves to maintain or even work the land. Likewise, James Lytton’s sale of the plantation to Ash would have been no accident. Perhaps Lytton had bought this land back in 1752 when it became available with the idea in mind that eventually Ash would be able to purchase it from him when he was ready to upgrade or expand his land holdings. The familial relationship and business connection make it clear that James Lytton and James Ash were quite close and it appears that James Lytton, as a kind of father to Ash’s wife Margaret, was acting as a dutiful parent to his virtual son-in-law. 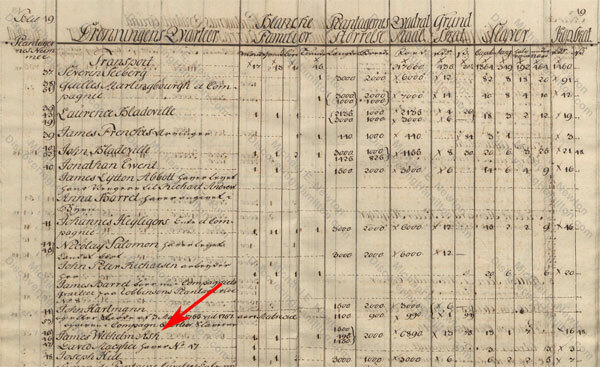 In December 1758, James Ash was still living on his estate along with a woman, presumably his wife Margaret Evans, one white servant, and 21 slaves. By this time, he had sold his original land, which had been redesignated No. 47 Queen’s Quarter, but still owned his parts of Nos. 45 and 46. 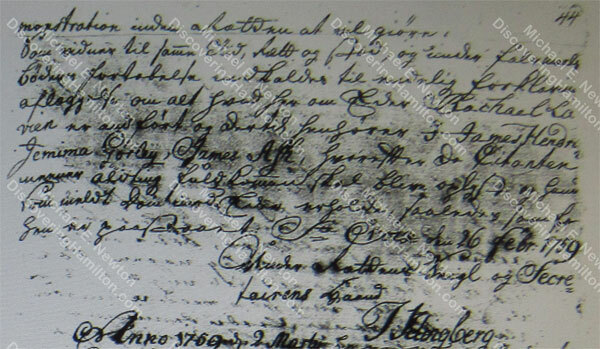 In February 1759, James Ash was summoned to testify as a witness in the divorce of John Michael Lavien and Rachel Faucett. As with Jemima Faucett Iles Gurley, no record has been found of James Ash’s testimony as a witness. In fact, there is no record regarding whether he testified or appeared before the court. Accordingly, we do not know if James Ash knew anything above and beyond what was already in the court record or which side he would have taken in this matter. 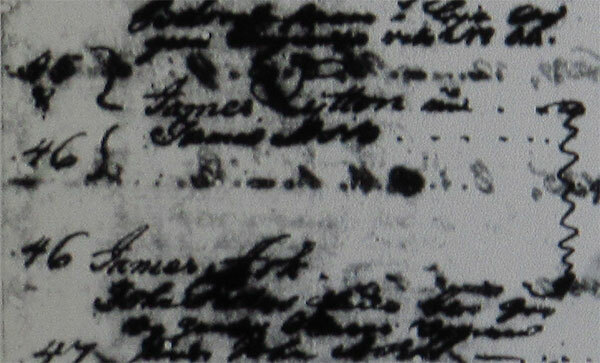 Nevertheless, we do know that it is incorrect to describe James Ash as a person “of no special note” who does “not otherwise figure in the records of Rachael.” He was a relative by marriage, closely connected to Rachel’s other relatives on St. Croix, and lived a short distance from Rachel and John Michael Lavien. In 1759, James Ash sold Nos. 45 and 46 Queen’s Quarter to a Thomas Callenan. After this, James Ash no longer appears in St. Croix’s matrikels. One might assume that he left St. Croix at this time, but other evidence shows that he remained on the island for some years afterwards. This document makes it clear that even though James Ash no longer appeared in St. Croix’s matrikels, he was still on the island as of May 1764 and even owned a house and slaves despite his not appearing in the matrikels. However, it is also evident that Ash was planning to leave the island so that he appointed attorneys to represent him in his absence and rented or lent out his house and slaves. You may have noticed that almost everything I shared here these last two weeks about James Ash directly relates to his relationships with the Faucetts, Evanses, and Lyttons. Of course, there’s a lot more about James Ash’s life about which I did not write, and certainly much more which has not yet been uncovered. 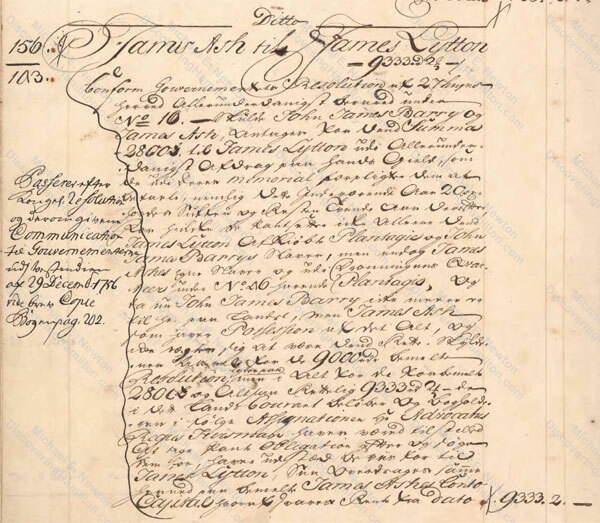 From the records that have been found and shared here, it is clear that from at least 1749 until 1764, James Ash was closely associated with the Evans, Lytton, and Faucett families on St. Croix and had repeated personal and business engagements with them. Until now, James Ash had been entirely overlooked and was believed to be a person “of no special note” who did “not otherwise figure in the records of Rachael,” but it is now known that his life on St. Croix was intertwined with that of Rachel Faucett’s, both directly with her, by being called to testify in her divorce, and through their mutual relations. As with the Jemima Faucett story, more research needs to be done into the life of James Ash. Where did James Ash come from? When did he first become involved with the Lyttons, Faucett, and Evanses? When did he die? When did his wife Margaret Evans die? Did they have children? Hopefully, more will be discovered regarding the life of James Ash, especially about his connections with the Faucetts, Evanses, and Lyttons. If you know or find anything, feel free to contact me or comment below. In the year that Lytton purchased these lands, the number of slaves he owned increased from 26 to 42. 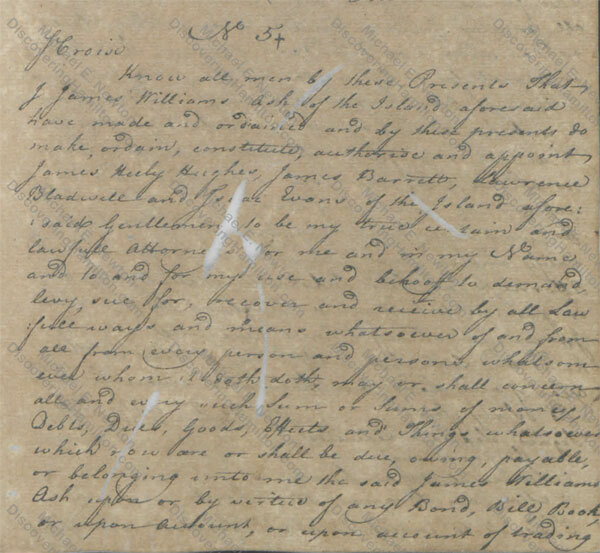 There was no significant change in his slave holdings when he sold these plantations to Ash, and Ash’s slave holdings were also little changed. It would thus appear that Lytton acquired up to 16 slaves along with the plantation and he kept those slaves when he sold the land to Ash. 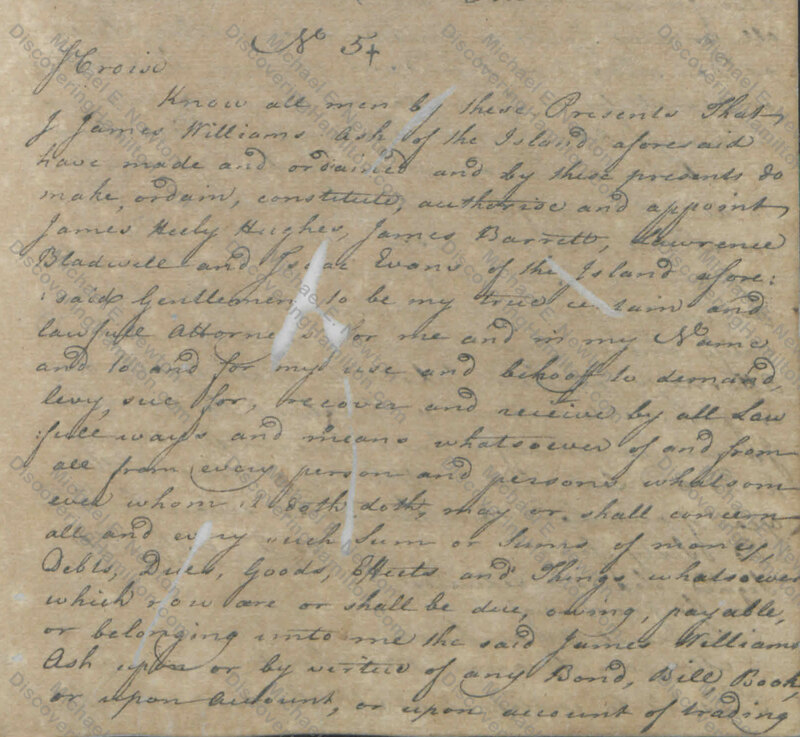 “Alexander Hamilton: Son of a Whore? 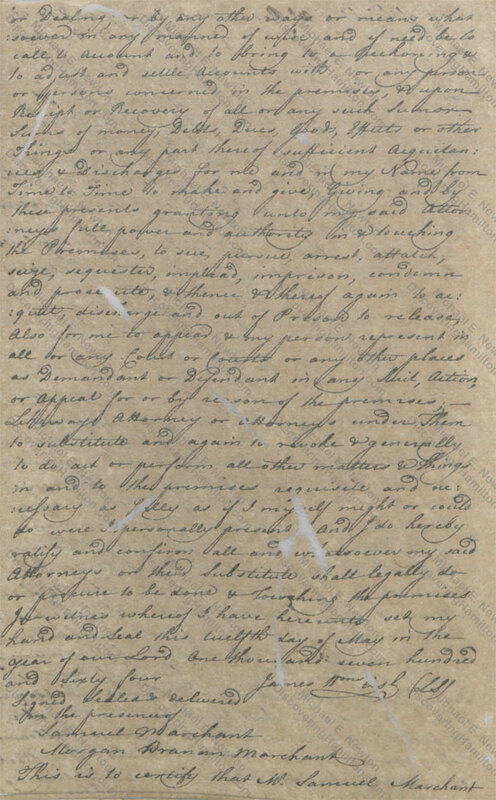 The Extramarital Affair of Rachel Faucett, Based on Newly Discovered Court Records from St. Croix,” DiscoveringHamilton.com. Mitchell, Alexander Hamilton: Youth to Maturity 473 note 46. © Posted on September 20, 2018, by Michael E. Newton. Please cite this blog post when writing about these new discoveries. 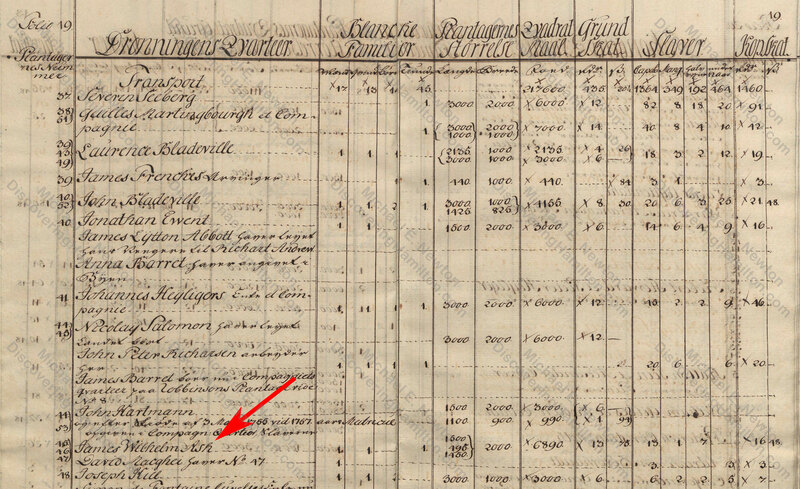 Where did Mary Uppington Faucett Live on St. Croix?